New Delhi, Feb 22 (IANS) Using the toilet in school was an ordeal for 15-year-old Vineetha two years ago because of poor sanitation and cleanliness. A class 10 student at ZPHS Kodurupadu School in Nellore district, Andhra Pradesh, the ordeal is now over with eToilets being installed in the premises. "Earlier, we didn't have proper toilet facilities to relieve ourselves since the facility was not properly maintained and was unhygienic. Many of us would bunk schools owing to this. But the installation of eToilets brought us huge relief. Initially, we had some apprehensions on using them but soon we got used to it," Vineetha told IANS in an email interview. eToilets are unmanned toilets which work on an indigenous technology and are placed on a cement or metal base. On the roof is a 225-litre-capacity water tank connected to the three flushes (pre-flush/platform washing/after-use flush). A display light outside shows whether the unit is occupied (red) or unoccupied (green). "On entering the eToilet, the indoor light switches on automatically and the pre-flush system wets the closet. Even if a user forgets to flush after using the eToilet, the system automatically flushes after the user exits. An automatic floor-cleaning mechanism is also provided through which the floor gets cleaned," Bincy Baby, Director, Eram Scientific Solutions, that developed the facility, told IANS in an email interaction. There are different variants of eToilets, starting from the Rs 1 lakh school model to the Rs four lakh public model. A total of 2,000 eToilets have currently been installed in 20 states: Assam, Andhra Pradesh, Bihar, Chhattisgarh, Delhi, Gujarat, Haryana, Himachal Pradesh, Jammu and Kashmir, Jharkhand, Karnataka, Kerala, Madhya Pradesh, Maharashtra, Punjab, Tamil Nadu, Telangana, Tripura, Uttarakhand and Uttar Pradesh. "The largest deployment of school eToilets was done as part of a Tata Consultancy Services (TCS) initiative. We have deployed automated and self-cleaning eToilets in 411 government schools in Nellore as part of the corporate social responsibility (CSR) initiatives of TCS. In total, 600 e-toilets were deployed across Andhra Pradesh and Tamil Nadu," Baby added. An eToilet mobile app launched last year is also available on the Google Play Store. The app helps people locate the nearest eToilets via maps and address listings, understand the mode of operations, mode of access and information on facilities such as napkin-vending machine, incinerator and sharing feedback, among others. "The most amazing thing about the eToilet setup in our school is that it is very hygienic and user-friendly. Accessories like napkin-vending machine and napkin incinerator are very useful and a boon to us. It would be really good if all schools have these automated and electronically-operated toilets," said Dhanya, a class 12 student in Kannadiparamba Higher Secondary School in Kannur, Kerala. Through the app, people can suggest new places where eToilets can be installed. As of now, about 2,000 people -- mostly travellers -- have downloaded the app. These eco-friendly toilets are quite convenient to track as well as hygienic. 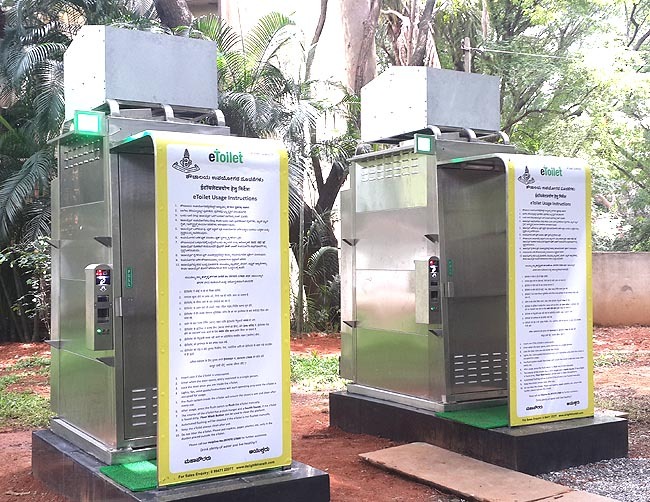 Keeping Prime Minister Narendra Modi's Swachh Bharat Mission in mind, Baby said that Eram is also planning to tie up with the 100 Smart Cities project where eToilets can play a crucial role in providing seamless, sustainable sanitation solutions.